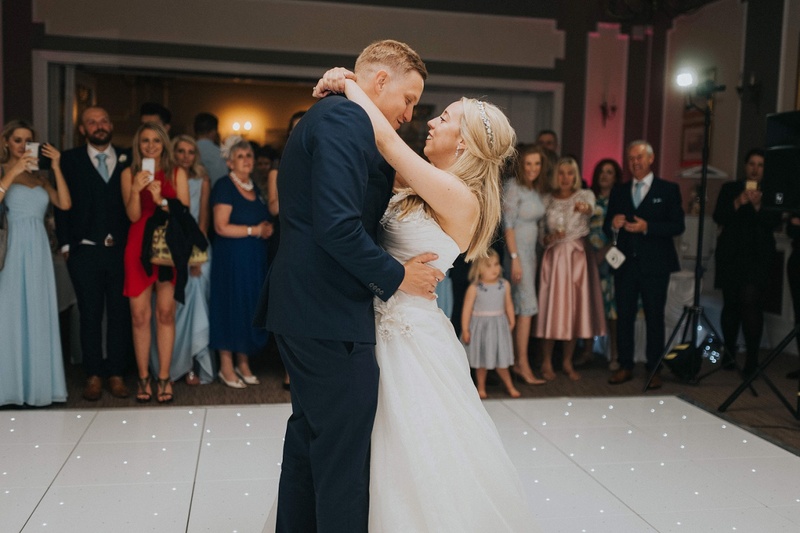 “Magical” is how we would best describe the wedding of Ashlie and Lee which centred around the couple’s love of Disney. 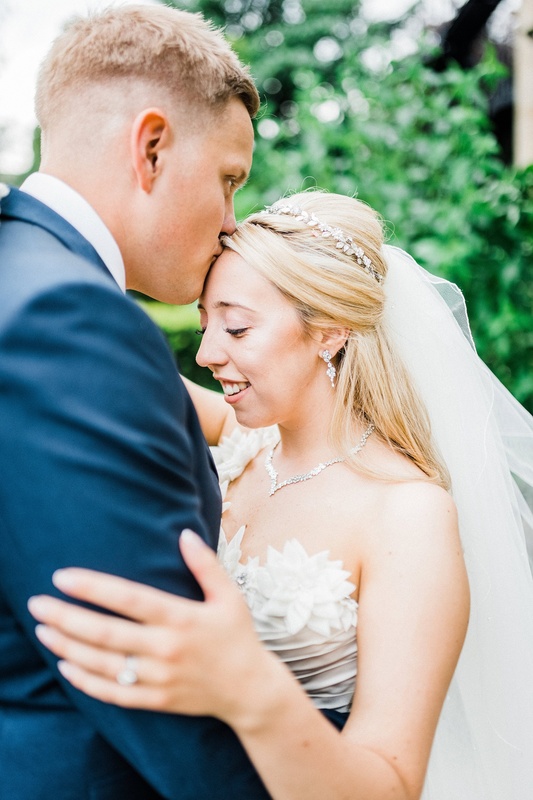 Stemming from a super-sweet proposal in front of Cinderella’s Castle in Orlando, the theme ran through all elements of your big day; from Ashlie’s stunning princess-style Alan Hannah gown, to their music choices, table names and wedding décor, resulting in a truly fairy-tale wedding. 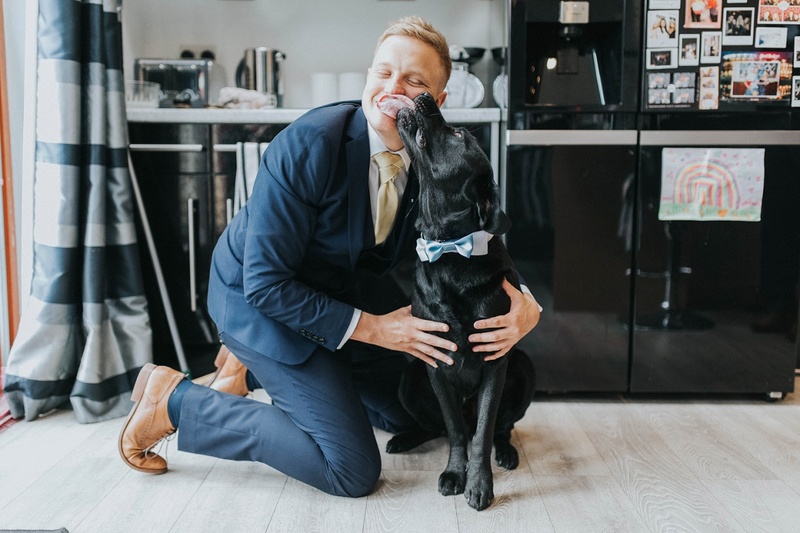 Another love of theirs also plays a key part in their nuptials as Messi, Ashlie & Lee’s handsome black Labrador, was present for the preparations and ceremony, watching intently from a church pew before posing for pictures with his newlywed owners following their “I dos”. With images by Arabella Smith. Ashlie says: Lee surprised me with a proposal at Disney’s Magic Kingdom in Orlando! We had dinner at Cinderella’s Castle where the firework and projections on the castle are held. We watched the firework display whilst eating our dessert. With a fifteen-minute window between the fireworks and the projections on the castle, unknown to me Lee had arranged for us to go right in front of the castle which isn’t usually accessible. We went to the front of the castle and as we were taking a few selfies a Disney representative came over and offered to take our photo. As we posed, Lee had his hand on my back and it just felt a bit fidgety, so I turned to look at him and there he was on one knee. It was the most magical proposal and of course I said yes! Our wedding date was 27th May 2017. We chose this date because it was a Bank Holiday weekend and we had guests travelling from across the country. 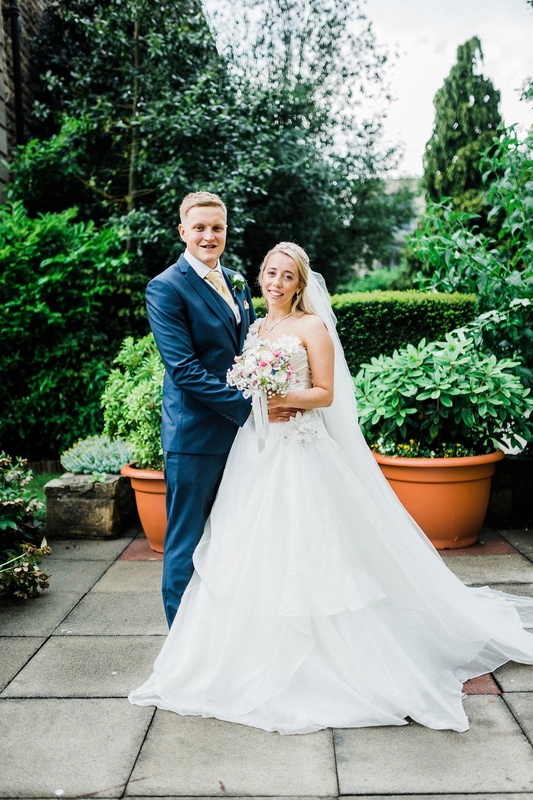 We got married at St. Thomas the Apostle Church in Killinghall. It is the church of my families and we were the fourth generation to get married there. Our reception was at St. George Hotel in Harrogate. We chose this venue because we loved the space and the menu they offered was amazing, there was something for everyone and they also allowed us to offer multiple dishes to our guests. Due to our love for Disney, our theme was a magical fairy-tale. We walked into an instrumental version of I See The Light from Disney’s Tangled and had instrumental Disney music played throughout the wedding breakfast. Our table names were different Disney couples and under the table name stands, which were from VMBespoke, we had little cards with a love quote from the movie the Disney couple were from. Our colour scheme was a soft light blue. When our bridesmaids tried on this colour they looked simply stunning and the colour was so dreamy. My dress was Melita by Alan Hannah, it was a full gown with floral detailing. I felt like a princess the instant I tried it on. Lee and his groomsmen wore bright navy coloured suit from Burton. As Lee and I are massive fans of the Marvel superhero films we had to find a way to add a subtle superhero touch and so Lee and the groomsmen wore different super hero cufflinks. They loved it! 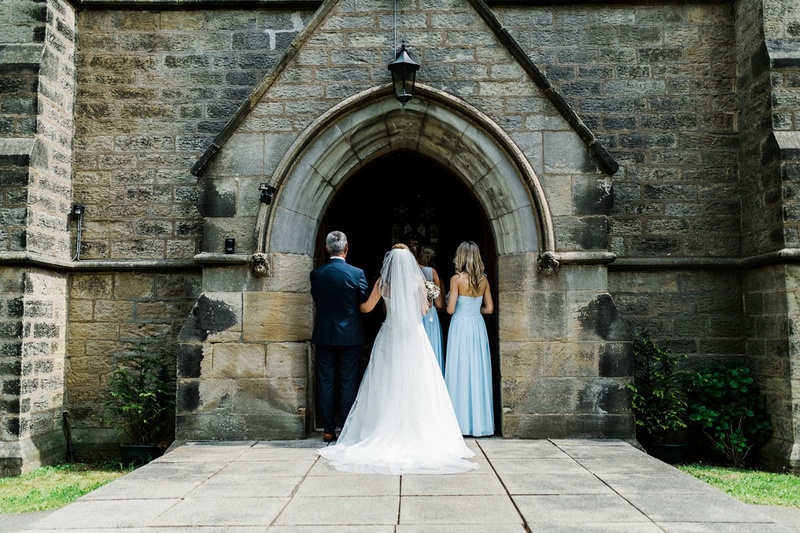 The bridesmaids wore different styles of a full-length light blue chiffon gown from JJ’s House online. I was a bit apprehensive when we first ordered them just simply because we were ordering from online and hadn’t seen the dresses in person. Even though you could send them back if they weren’t right I still had that little uneasy feeling in the back of my mind. 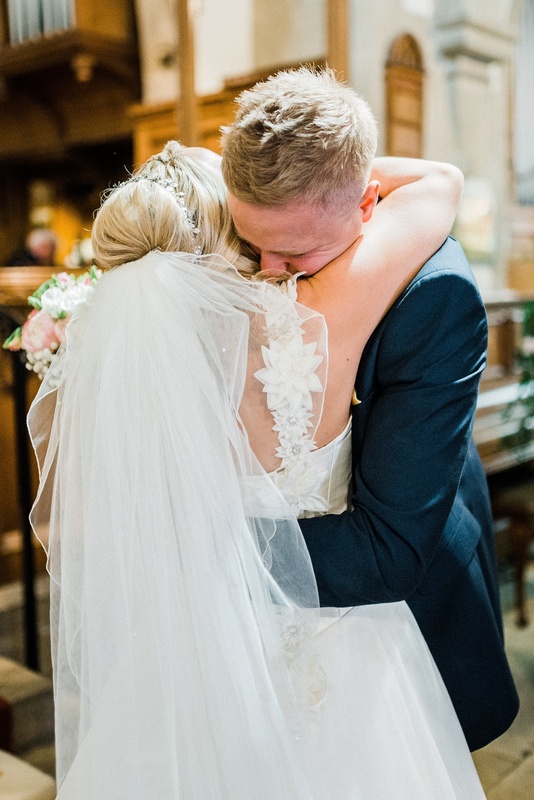 However, I was blown away by the quality and I would definitely recommend these dresses to any bride and as you can see, they looked simply stunning. Our photographer was Arabella Smith. As soon as we saw her work, we knew we needed her to be our photographer. Her light, soft, romantic style suited the fairy-tale theme we were going for completely and we absolutely love the photographs of our magical day. Our videographer was Pete from Yorkshire Wedding Videos. Having a videographer is the best decision we made, and Pete did a sensational job, we are so in love with video. Our flowers were arranged by Becky Bullen, who is actually a lovely friend of ours. I had a bouquet with all sorts of blues, pinks and yellows with a gypsophila collar. My bridesmaids had bouquets of gypsophila and the flower girls had rose petals which the scattered down the aisle. The groomsmen had white Yorkshire rose buttonholes with Lee having a little bit extra. Becky also did the flowers for our reception and arranged a lovely pedestal for the ceremony. We had milk bottles filled with flowers that matched by bouquet and the rest of the flower arrangements for our centrepiece and then rose petals sprinkled all over the tables, including the cake and gift table. She captured our vision perfectly and completely brought it to life. I was blown away by the amount of effort she put in, it really shone through as we had so many lovely comments about the flowers and still get them today! We used Dreams Come True styling company for our starlit backdrop, starlit top table and cake table skirts. We used a wishing well in place of a post box for our guests to place cards in, which was obviously a perfect touch as Disney’s Snow White. We also hired giant LED love lights which added a great touch to the styling. 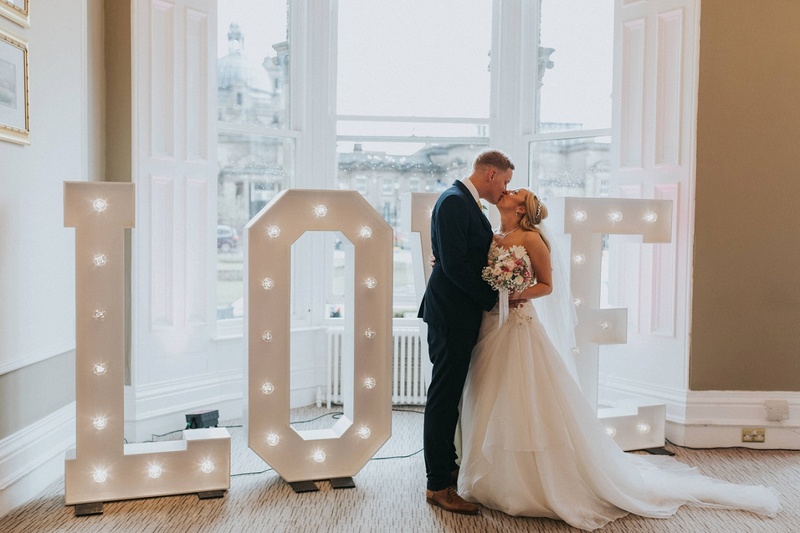 For the favours, we got custom wooden carved names for our guests from VMBespoke, which also acted as place names, the font style was fairy-tale which was perfect for us. They were such a great touch and everyone loved them and took them home! We also had chocolate truffles for after the wedding breakfast served with teas and coffees, they were on stand also created by VMBespoke. A family friend of ours made our beautiful wedding cake. We had three tiers which were white chocolate and passionfruit, white chocolate and raspberry and chocolate fudge cake. We kept it very simple and stuck to white and blue. We actually took a swatch of the bridesmaid dress so the colour could be matched perfectly. The bottom layer was ruffled, the middle layer was light blue and the top layer had elegant lace effect trimming on it. Our topper was a bride, groom and a Labrador as we had to include our beautiful boy, Messi, who was also our ‘best dog’ in our day. We were lucky that were allowed to give our guest five different options of a starter, main and dessert. The presentation was incredible, and everyone was more than satisfied! As for wine we provided the wine for the tables. We had a Cabernet Sauvignon, a Sauvignon Blanc and a fruity rosé. We had the amazing Tom Wright to perform magic to all our guests. He was incredible, and the day wouldn’t have been the same without him! All our guests were completely blown away and we would definitely highly recommend him. We had a Booth Revolution photobooth for the evening reception, which was just great fun. Who doesn’t love a good photobooth?! Looking back at all the photos just shows what a great time our guest had, and we are in constant fits of laughter. We also had a starlit dancefloor – a last-minute decision but what a great decision it was! It made the first dance even more perfect and just having it for the evening just made things a bit more special for us. We loved it and had so many people comment on it after the wedding so would definitely recommend getting one to other couples. The most special touch we had on the day was having our beautiful black Labrador as best dog. We were so lucky as he was allowed to be a part of the ceremony. He sat with the groomsmen (literally sat on a pew seat) whilst I walked in and then was allowed to be with Lee and I for the rest of the ceremony. It meant so much to us to have him right beside us as we said our vows. Lee had found an amazing designer called Ewa Muszewska on Etsy, who created our Disney fairy-tale guestbook and ring box holder. She went through the whole design process with Lee, so it was perfect for us. A personal special touch on the day was actually a complete surprise for me. When I met Lee at the alter, he showed me that he was wearing my grandfather’s watch. It meant so much to me and I was so touched. Lynn, our wedding coordinator at St George Hotel, was great and she was there behind the scenes all day making sure everything went perfectly. Nothing was too much of an ask and we felt our day was in great hands. The venue looked beautiful, better than we could have imagined. Lee and I were on such a high throughout the whole day it’s hard to pick one favourite part. It is filled with so many highlights. A standout moment though was when my bridesmaids and flower girls walked down the aisle before me. As my flower girls got to the alter one of them gave Lee a note I’d written for him. It was a bit of a running joke that throughout our relationship I refused to call Lee ‘awesome’ and he told me he wouldn’t marry me until I called him it. So, therefore on the note she gave him it said: “You’re awesome”. It took Lee completely by surprise and made him a bit emotional especially when he then saw me walking down the aisle.